and my papal pick is….white smoke please! Cardinal Luis Antonio Tagle from Manila. I first heard of Archbishop Tagle during the reports coming from the recent Synod for the New Evangelization. In the midst of pompous speeches about the evils of secularism and those nasty fallen away Catholics, he stood up and made a heartfelt call for more silence in our church. It was announced during the synod that the pastoral and much-loved Archbishop Tagle would receive the cardinal’s hat in the upcoming consistory, which immediately sparked excited papabile musings. In the Imus diocese, Tagle was famous for not owning a car and taking the bus to work every day, describing it as a way to combat the isolation that sometimes comes with high office. He was also known for inviting beggars outside the cathedral to come in and eat with him. One woman was quoted describing a time she went looking for her blind, out-of-work, alcoholic husband, suspecting she might track him down in a local bar, only to find that he was lunching with the bishop…. Tagle’s doctoral dissertation at Catholic University, written under Fr. Joseph Komonchak, was a favorable treatment of the development of episcopal collegiality at the Second Vatican Council. Moreover, Tagle served for 15 years on the editorial board of the Bologna, Italy-based “History of Vatican II” project founded by Giuseppe Alberigo, criticized by some conservatives for an overly progressive reading of the council. Our church has suffered for too long from a centrist form of governance. The current malaise in the curia is proof that reform is needed, a reform that embraces the need for collegiality and not a heavy handed, top-down style of leadership. Our church needs a chief pastor who can speak to the heart of the faith, who can excite crowds with his homilies and speeches – not bore them to death. The new evangelization is not about proclaiming dogmas and identifying evils. It is about reflecting a faith that is first and foremost a relationship with a living God. It is about reflecting the joy in knowing Jesus, and embracing the mission to live the gospel message of peace and justice in the world. 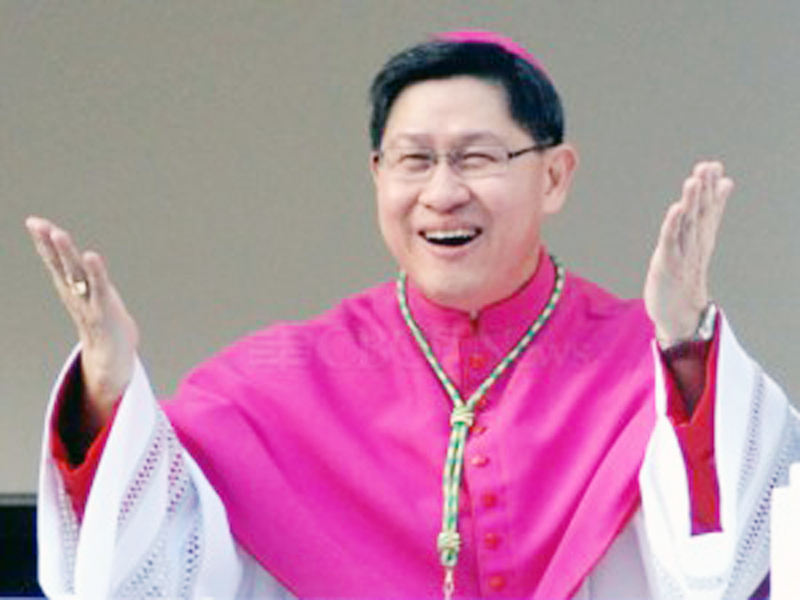 Some say that Cardinal Tagle is a long-shot candidate, at least this time around. He is too young. He is possibly too “nice” to clean up the current mess at the Vatican. He doesn’t have the curial experience of older cardinals. If we expect our pope to be super-human, then no one can dare to fill the shoes of the fisherman. But, the fisherman who filled those original shoes wasn’t perfect either. A man who believes in a collegial style of leadership will not be a micro-manager. He will surround himself with those who have the necessary talents for each task. Will the man who next steps out on the papal balcony produce a collective “meh!” around the world? Or, will he ignite a roar of excitement that will send the pigeons of St. Peter’s Square soaring for cover? If Cardinal Luis Antonio Tagle dons the papal whites, it will be the latter! women are still predominantly servants of the Servant of the servants of God! let the papal games begin….no spectators allowed! Excellent analysis, Isabella. I’m with you. Since it can’t be either of us, at least we can lift up the values that we think are important for the Church to thrive. I also like the cardinals from Austria and South Africa. Thanks, Susan! Personally, I’m hoping for a long conclave. Apparently that would mean that the current front runners can’t get a majority and the long shot candidates would get some serious consideration. BTW, I’m a fan of Cardinal Napier of South African and Cardinal Schonborn of Austria, too. Do we ever need someone like him! I like your pick, Isabella! But I think I like better the image of you parading into the Sistine Chapel in red… 😉 Happy conclave, everyone! And a happy conclave to you too!